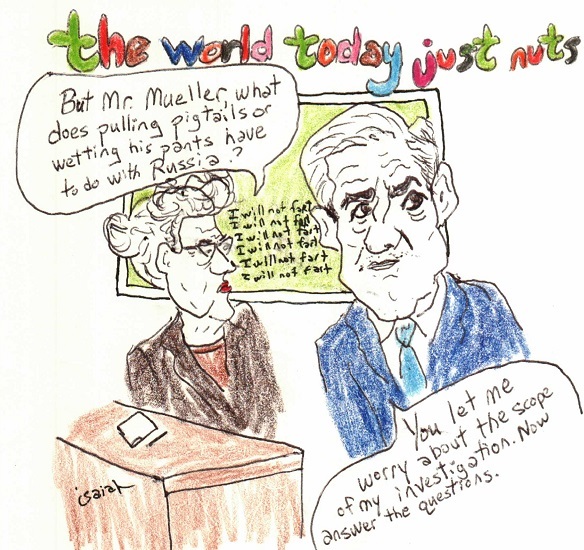 Isaiah's THE WORLD TODAY JUST NUTS "The Scope of the Investigation" went up Sunday. I love that comic and Mueller does need to be reigned in. Moving over to Donald Trump. Did not vote for him. Doubt I'll vote for him in 2020. Maybe if he was doing something I approved of, I would but that's not really going to happen short of Jesus speaking into Donald's ear and waking him up. But I did give him credit for NASA's renewed interest in the Moon and I'll give him credit for something else. You know who commented on President Trump leaving the Iran deal? Barack Obama Hillary Clinton John Kerry Ben Rhodes John Brennan James Clapper Susan Rice You know who didn't comment on the US detainees that Trump secured the release of? You guessed it, those same clowns. I believe it's three Americans who have been released from North Korea. He does deserve credit for that. I have no problem saying good job on that. Here's the only Tweet with video I could find on it. Again, I will give him credit for that. Good job on that. Wednesday, May 9, 2018. The media loves Iraq -- as a sidebar or a reference point. Let's start with the media and when they think they are self-critiquing. Imagine if every interview with John Bolton or Benjamin Netanyahu included these questions. 1) You say inspections can't verify Iran's disarmament. Didn't you say the same about Iraq? 2) Why doesn't Israel permit inspections of its nuclear weapons program? Peter then links to his piece at THE ATLANTIC claiming Iraq amnesia among the public allows the Iran deal to be walked away from. First, notice that in these pieces the Iran deal is "good." We don't examine it any more than we did when Ben Rhodes was manipulating the press in real time. We don't examine it, we don't detail it, we just pronounce it good. And, as proof of its goodness, we note that John Bolton's against it. That's called responsible advocacy journalism, apparently. Second, if there's Iraq War 'amnesia' it's because of the media. And if Peter wants to be against the Iraq War today (the one he was for when it started), maybe he should answer about his amnesia. The Iraq War is 15 years and counting. I guess I missed his big think piece on how the US gets out of Iraq finally? 15 years and counting. And Peter and his ilk just accept this as normal? Seems to me if you were a gas bag talking the nation into war with Iraq in 2003 and you claim, years later, you're against it, you should be gas bagging constantly about how to end the Iraq War. Or is it all just a word game for you? The fact is there’s no known mission end for Iraq, yet. Top commanders, waiting to be told by Washington to get bigger or smaller, just keep going. And that’s the worry of Americans back home, who largely marked the invasion’s 15th anniversary — if they noted it at all — by wondering what the U.S. is still doing there, and how long it’ll last. The Iraq War continues. The US is still bombing Iraq. But while the Defense Dept issues announcements about their bombings, these announcements don't make the TV news or register because they're barely covered -- if at all. In Peter's piece, he goes out of his way to write of the Iraq War as something far int he past. That's on him. Nearly half (48%) of Americans say the decision to use military force was wrong, while slightly fewer (43%) say it was the right decision, according to a Pew Research Center survey, conducted March 7-14 among 1,466 adults. Peter knows that poll. He uses -- misuses -- it in his article to slam Republicans while failing to note that Oliphant states the partisan attitudes or more less the same as they were years ago on this topic. Poor Peter, it's a hard life where ever you go. The single biggest reason Iran's regional position has gotten so much stronger is....the Iraq war. In other words, the last time neoconservatives got their preferred policy outcome they created the very problem they are now decrying. So what do you think happens next? Chris is at MSNBC and has to work within that structure. I do understand it. Joy Reid's got a ridiculous Tweet about people worrying over "rhetoric." What is MSNBC but hours upon hours of fuming over rhetoric? But, Chris, if you feel the outcome created is so awful -- I do, as well, Chris -- why isn't that the topic of hour upon hour of your show -- or any show on MSNBC today? If the outcome matters, then it should matter as a topic all by itself. If you seem to believe people should learn from what came before, why the black out? Why the refusal to cover what did happen, what continues to happen? Neither the war nor suffering has ended in Iraq. What has ended is the media coverage. In what world is that responsible? The US is engaged in war and the US media doesn't feel the need to cover it. They will spoon feed us junk news constantly. They just won't cover the things that truly matter. One more time to Nanci Griffith's "It's A Hard Life Wherever You Go:"
While no one in the media leads the call for a withdrawal from Iraq, the gas bags try to act as though salvation will come via Iraq's next round of elections. May 12th, elections are supposed to take place in Iraq. Ali Jawad (ANADOLU AGENCY) notes, "A total of 24 million Iraqis are eligible to cast their ballots to elect members of parliament, who will in turn elect the Iraqi president and prime minister." RUDAW adds, "Around 7,000 candidates have registered to stand in the May 12 poll, with 329 parliamentary seats up for grabs." AFP explains that the nearly 7,000 candidates includes 2014 women. THE SIASAT DAILY adds, of the nearly 7,000 candidates, "According to the electoral commission, only 20 percent of the candidates are newcomers." Ali Abdul-Hassan and Sinan Salaheddin (AP) report, "Iraqi women account for 57 percent of Iraq’s population of over 37 million, according to the U.N. Development Program, and despite government efforts to address gender inequality, the situation for Iraqi women has declined steadily since 2003. According to the UNDP, one in every 10 Iraqi households is headed by a widow. In recent years, Iraqi women suffered further economic, social and political marginalization due to decades of wars, conflict, violence and sanctions." RUDAW also notes that 60 Christian candidates are competing for the five allotted minority seats. How do they elect the prime minister? This comes after the general election and is based on who won seats in the election. Abdulrahman al-Rashed (AL ARABIYA) explains, "To win the premiership, a candidate needs to win the majority of the votes, i.e. the votes of 165 MPs out of 329. Since it is a multi-party system, it is almost impossible to win these votes without sealing political alliances. The governorate of Baghdad is the most important one because it is the largest with 69 seats." The chief issues? Mustapha Karkouti (GULF NEWS) identifies them as follows, "Like in previous elections, the main concerns of ordinary Iraqis continue to be the lack of security and the rampant corruption." Sunday, RUDAW explained that the electoral commission "so far fined 210 candidates for violations of commission guidelines." As noted in the April 3rd snapshot, pollster Dr. Munqith Dagher has utilized data on likely voters and predicts that Hayder al-Abadi's Al-Nasr will win 72 seats in the Parliament, al-Fath (the militias) will get 37 seats, Sa'eroon (Moqtada al-Sadr's new grouping) will get 27 seats, Nouri al-Maliki's State of Law will get 19 seats, al-Salam will get 18 seats (KDP and PUK parties for the Kurds), Ayad Allawi's Wataniya will get 15 seats. There are others but Dagher did not predict double digits for any of the other seats. The number are similar for the group of those who are extremely likely to vote (Hayder's seats would jump from 72 to 79 seats). Other predictions? The Middle East Insstitute's Fanar Haddad insists to Sammy Ketz (AFP) that the post of prime minister will come down to one of three people: Hayder al-Abadi (current prime minister), Nouri al-Maliki (two time prime minister and forever thug) or Hadi al-Ameria "a leader of Hashed al-Shaabi, a paramilitary network that played a pivotal role in defeating IS. Ameri comes from Diyala province and is a statistics graduate from Baghdad University. He fled to Iran in 1980 after Saddam executed top Shiite cleric Ayatollah Mohammed Baqr al-Sadr. The 64-year old is widely viewed as Tehran's favoured candidate." Again, while no one in the media leads the call for a withdrawal from Iraq, the gas bags try to act as though salvation will come via Iraq's next round of elections. This despite that the bulk of the candidates are the exact same ones that have campaigned in every election. This despite systemic corruption that is now rooted in the government. But somehow, this go round will be different. That's not a finding that the people of Iraq believe based on real polling (real polling has a margin of error). In 2010, the Iraqi people saw the US government overturn their votes. Is there really a reason that they should believe voting changes much of anything? 50 candidates for #Iraqi parliament have #UK nationality. 30 candidates are holding #Iranian passport, also there's 6 #Syrian candidates are participating in #iraqElection.